Travel to Germany during carnival season in February and experience entire cities engaged in an all-out party. It is a joyful, silly celebration with a long history in Catholicism, today punctuated by street parades and costume balls. 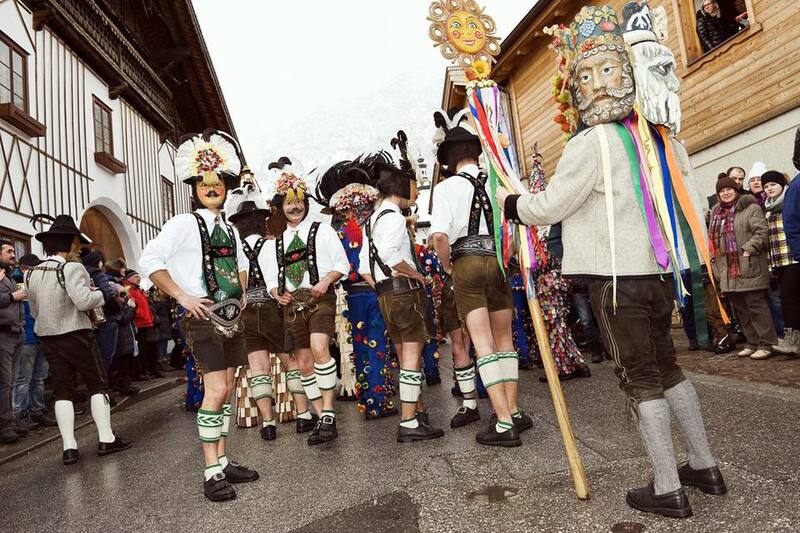 This celebration is called Karneval or Fasching (pronounced FAH-shing) depending on the region of Germany. In general, Karneval is used in mid and northern Germany (except in Mainz), with Fasching primarily used in southern Germany. The name Fastenacht is also used in Baden-Württemberg. This is a celebration of excess. Carnival is the chance to get wild before going pious during Lent. It usually involves public celebration of parades, costumes, and balls. During the day, drink a warming glühwein and a kölsch (or ten) and eat a krapfen (doughnut). Dress up in a traditional costume such as a jecken (clown). All the good stuff like red meat, alcohol, and sugar are consumed with glee before they are cut off during Lent. Visitors should also join in the lively events. Along with parades, there are mock battles like food fights. Satire is celebrated and all authorities are mocked - especially political figures. Everyday rules and norms are on hiatus. Weiberfastnacht (the Women’s Carnival or "Fat Thursday" in other parts of the world) is held before Ash Wednesday and is a day for the ladies. Costumed women gather in the streets, gleefully attacking men by cutting off their ties. For their compliance, men are rewarded with a ​Bützchen (little kiss). Feasting is essential as this is the last chance until Easter. After the booze-filled afternoon, there are masked balls and parties in the evening. Carnival weekend carries on in its intoxicated manner under the valor of tradition. A Frühschoppen, an early-morning drink, is just one of these respected customs. Expect more formal balls in the evening. Rosenmontag (Rose Monday) takes places the following Monday and is a loud wake-up for those with a hangover from the weekend. Marching bands, dancers, and floats strut down the streets, with performers tossing out ​kamelle (sweets) and tulips to the boisterous crowds. In a show of pointed humor, floats often depict caricatures of politicians and famous German personalities. There are rallying cries of "Kölle Alaaf" from the crowds in Cologne. Veilchendienstag (Shrove Tuesday) is a bit quieter. The main event is the ceremonial burning of the nubbel (life-size straw figure). Aschermittwoch (Ash Wednesday) marks the end of a near-week of partying for Carnival. The actually pious go to church where they receive an ash cross to wear throughout the day. A traditional fish dinner is the start of healthier living for the coming season. The carnival season in Germany (also called the "Fifth Season") officially begins on November 11th, at 11:11 a.m. In this magic hour, the elferrat (Council of Eleven) comes together to plan the events for the upcoming festivities. The official hats of the councils' members, fool's caps with little bells, set the standard for the following events. The actual celebration of German carnival kicks off 40 days before Easter. This is the last big party before Ash Wednesday and the beginning of Lent filled with parties and consumption. Almost every German city celebrates carnival and organizes a street parade in its city center. The largest and most well-known festival in Germany takes place in Cologne. Its festivities are broadcast on TV across the nation. But that is not the only place to party. Other German cities with large Carnival festivals include Düsseldorf, Münster, Aachen, and Mainz. Every summer, Berlin celebrates its own special carnival, the colorful Karneval der Kulturen (Carnival of Cultures). More than 1.5 million visitors pay tribute to the multicultural spirit of Germany’s capital with this four-day street festival, which also features a great carnival parade with performers from over 70 different countries. This is one of the highlights of Berlin's festival season.